1. HDL to Cholesterol Ratio. How much of your cholesterol is the so-called “good” cholesterol, which is HDL? HDL cleans up damage, so you want a lot of it so that it can clean up the damage faster. HDL is like the dump truck that is carrying the heavier load. If 24% of your cholesterol is HDL, you’re in good shape. You want that above 24%. That’s an easy number that supports more positive health as opposed to just looking at the total cholesterol, which is actually a very poor indicator of mortality. Regardless of how high your total cholesterol is if it is made up of the right stuff you’ll be ok.
2. Triglyceride to HDL Ratio. Triglycerides—the fat that is in your blood—compared to your HDL should be below 2. This means you don’t want more than twice as much fat in your blood as there is the HDL to help clean it up. Nutrition drives this. Sugar is driving up the triglyceride number. Your liver turns fructose into triglycerides. Then you have more fat floating around in your blood which gets the ratio off. That’s going to be a big burden on your heart, on your liver, and on your kidneys to try to filter you out. If you have a good ratio, below 2, you have enough HDL cleaning up triglycerides. That’s a good number. So you want to look at lowering triglycerides and increasing HDL. Sugar must go down and healthy fat must go up. LDL is not involved in the first two measurements that I showed you, but it is still important. Not all LDL is made equal though. Since most of the statin drug recommendations revolve around LDL, you need to know how much harmful LDL you have. The smaller the LDL particles, the more harmful. The smaller lipoproteins of the LDL are the ones that can get into the vessels and cause issues, like hardening and clogged arteries. Bigger particles have a difficult time doing this because they can’t pass through the vessel. So even if LDL is increased, as long as you have a low amount of small particles, you are at much less risk. Your fasting insulin levels have a huge relationship with diabetes and cholesterol levels. Insulin is responsible for getting rid of all the sugar you ingest (carbs, bread, grains, fruits, desserts, etc). You want your fasting insulin number between 2-6. As you eat more sugar, more insulin is required. A typical American has a fasting insulin level around 8-10. As the insulin level goes up, your body has to work harder to get rid of the excess sugar. This leads to taxing damage on your pancreas, liver, blood heart, and hormone system. The whole system begins backing up which leads to weight gain and eventually metabolic diseases like high cholesterol, high blood pressure, diabetes, and eventually heart disease. A healthy insulin level indicates a well functioning system. 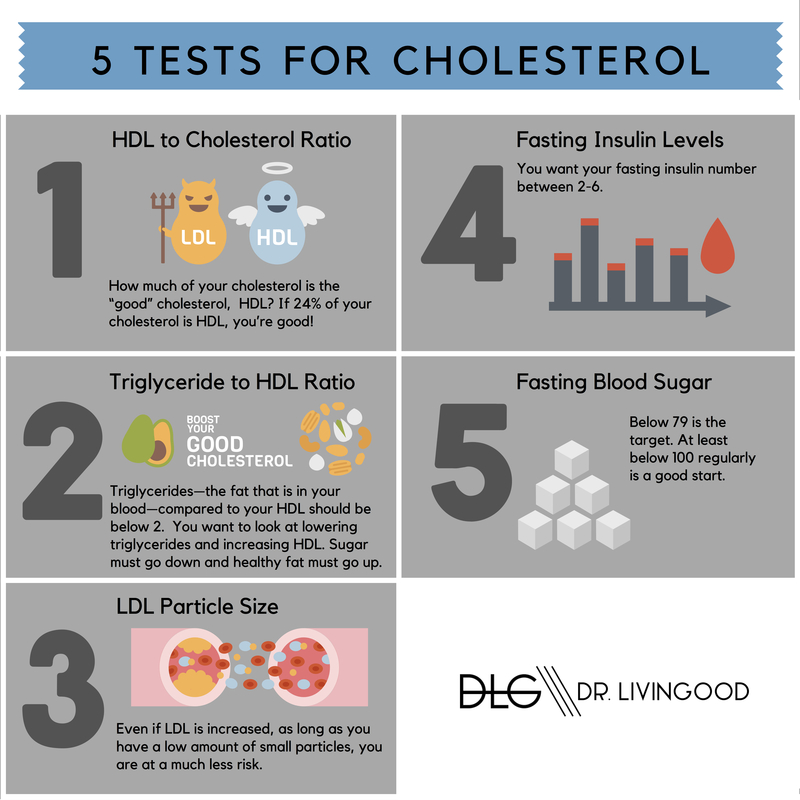 The above are some numbers you can look at to get a better gauge if are you actually at risk, instead of, “Is your cholesterol number above 200?”. That’s a very poor way of going about it. These are good conversations to be having with your doctor or a cardiologist if you’re working with one. Always consult them for more clarity. If you still have abnormal numbers then action must be taken. If you are not willing to change your eating and lifestyle then you may need to take drugs. Based on what we talked about the obvious question is there a less harmful way? Get natural solutions and get to the cause of your cholesterol problem now. Who do you know on cholesterol drugs right now? Will you help them by sharing this article?